Digital printing is the most up-to-date printing method. It is the only printing method that does not use pressure for printing copies and also there is no interlink to ensure printing. The original is transferred from the computer directly to the paper. No printing forme is used here. The origins of digital printing can be logically found in times after the first computers were assembled. Historically, the first printer that could be considered as digital was invented in 1970. It was a dot printer. Nevertheless, the print quality was not too high and the activities were started immediately to replace dot printers with inkjet printers. It was, however, only in 90’s when the inkjet printers became a common equipment of offices and homes. Until then their quality was low whereas the price was very high. On the other hand the origins of laser digital printers are dated back to 1971. That time, a man called Gary Starkweather built the first Xerox laser printer. Digital laser printers were commercialized in 1977 and they appeared in houses in 1984. In spite of all efforts the overall digital printing quality was low in the past. Therefore this technique could hardly had posed a competition with the other printing techniques. The situation has changed recently with an increased quality of the digital printing. In specific applications the digital printing can easily substitute offset and/or gravure printing. Today the digital printing is based on electrography (laser printers) or ink-jet printing (inkjet printers). 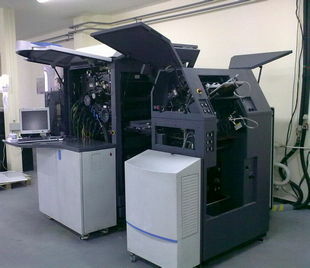 The complete printing process is controlled by a computer. Due to a missing printing plate the computer can control also the colour and amount of ink applied on the specific areas. Inkjet printers are working on a principle of ejecting a very small ink droplet with a high speed towards the substrate. To give a sense of scale, the ink droplets volume is approx. 35 picolitres and they are ejected with a speed of 50 to 100 km/h. The distance between the substrate and the print head nozzles is only 1 mm. Inkjet printers can be divided in thermal inkjet printers, piezoelectric inkjet printers and solid ink (wax) printers. Thermal inkjet printers work with tiny heating elements that heat the ink cartridges. When the ink is heated to the specified temperature a bulb is created that causes ejecting the ink droplet. Piezoelectric inkjet printers work with piezoelectric crystals. Piezoelectric crystal is an object that can change its shape. There are nozzles located in the crystal cells. The cells can shrink or expand and the nozzles then eject the ink. Solid ink (wax) printers work on the same principle as thermal inkjet printers. The difference is in the ink used. The solid ink printers use special solid ink cartridges with a wax consistency. It has an advantage of the ability of mixing the required tint of individual dots without overlapping the screens. The printing quality is higher with fancier colours. The difference between commercial and household inkjet printers is that the printed copy is created wall-to-wall. The household printer print head with nozzles moves above the substrate. Print heads of commercial printers are static. Large-scale printing utilizes a special method of ink-jet printing. It is so called continuous inkjet method. Unlike the other methods the continuous stream of droplets is ejected instead of timely ejecting individual ink droplets. The selected droplets of the stream are deflected to drop on the substrate and the remaining stream is returned via a collection system back in the reservoir. This method is ideal for large-scale printing since printing is very fast. The advantages of the ink-jet printing consist mainly in a quiet operation, print quality and smooth details. However, ink-jet printing has also some disadvantages. For example, high prices of inks or nozzle plugging with dried ink. Also the ink lifetime is limited since they fade out over time. The laser printing principle consists in the electric charge transfer via a transfer roller. The drum coated with selenium is irradiated with a laser beam over the areas that should be printed and therefore they are charged as required. The charged drum picks up the charged powdered ink (toner) particles with the opposite polarity. They adhere only to the areas that were exposed to the laser beam since these areas have an opposite polarity than the toner particles. The particles are then transferred to the substrate (paper). The ink is fixed on the paper using a pressure roller that is heated to the high temperature. When the ink is transferred to the paper the cleaning blade wipes off the toner residues. The charge from the previous printing phase is completely removed from the drum using a bulb and the whole process may be repeated. The advantage of laser printers compared over ink-jet printers is in their speed. Ink-jet printers will never achieve such a speed. Another advantage is the precision of details, e.g. when printing with small fonts. The laser-printed copy is just sharper which can be visible on the details. Another significant advantage is the ink (toner) price as well as the longevity of the printed copy. Ink-jet prints fade out over time. Laser printed copies do not show this effect. Digital printing in general experiences a huge boom over the last years. In some cases it can substitute offset printing and gravure printing. 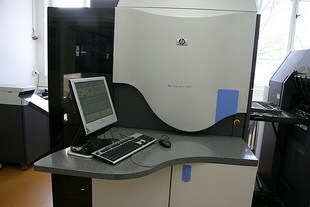 It is used primarily for low volume printing. Therefore it will never be used e.g. for printing newspapers. This privilege remains with the offset printing. Anyhow, it can be expected that the interest in digital printing will grow up and its applications will be more and more common.